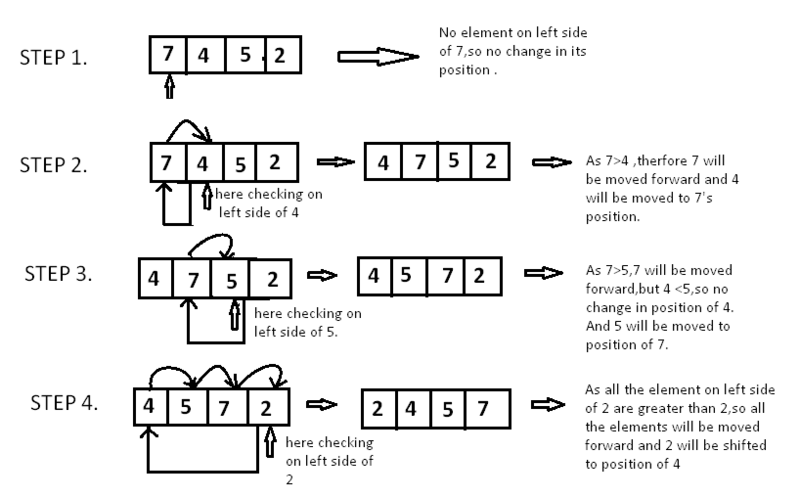 Insertion sort is based on the idea that one element from the input elements is consumed in each iteration to find its correct position i.e, the position to which it belongs in a sorted array. // moving the left side element to one position forward. // moving current element to its  correct position. Take array $$A = [7, 4, 5, 2]$$. Since $$7$$ is the first element has no other element to be compared with, it remains at its position. Now when on moving towards $$4$$, $$7$$ is the largest element in the sorted list and greater than $$4$$. So, move $$4$$ to its correct position i.e. before $$7$$. Similarly with $$5$$, as $$7$$ (largest element in the sorted list) is greater than $$5$$, we will move $$5$$ to its correct position. Finally for $$2$$, all the elements on the left side of $$2$$ (sorted list) are moved one position forward as all are greater than $$2$$ and then $$2$$ is placed in the first position. Finally, the given array will result in a sorted array.